This software was tested on MacOS X (10.4.8) on Mac intel. This software was tested on MacOS X (10.3.9) on Mac PPC. This freeware is Universal (for Mac intel and PPC). For that you can use each number one alone time to the maximum (you are not obliged to use all the numbers). Only the positive numbers are authorized. The software can give you a solution, if you can't find one of them. The provided answer is the solution which requires less calculation, if there is not solution, software gives the solution nearest to the target. You can use the Copy/Paste for storing the answer. To begin a new game, you can choose the numbers or click on the "New game" button for generating a random game. Click on "All to erase" for erasing all and choose your numbers for a new game. Click on "New game" for a new random game. While a game you can click on the "Cancel an operation" button for erasing the operation in progress or the last operation. Since version 2.3 the software is able to manage time, click on the menu "Preferences" (Apple + P) to select the duration of a game. You can also choose not to activate the management of time. 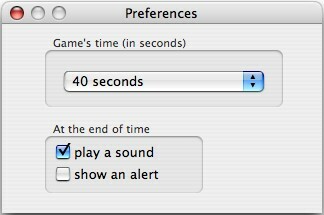 You can select an action for the end of game when time is past: nothing to make, to play a sound, to display an alarm or to play a sound and to display an alarm. If you have selected a duration in the preferences, when you click on the "New game" button, the stopwatch (the bar of progression) starts automatically, if you want to choose to you even your numbers you must initially click on the "All to erase" button so that the stopwatch starts at the time of your first operation. Since version 2.4 the software is localised in English. For playing ti the simple version, click on the menu "Version" and choose "Simple version". This version was made fir the children, we can only use + and - and the target must be between 1 and 99. You can generate a text file with 10 to 50 counts with answer. It can be useful for the teachers. Click on the menu "Generate" and choose your number (the software can spend several seconds to generate the text file, according to the power of your mac and of the number of accounts to be generated). It's my first software written in Cocoa (Objective-C) for MacOSX. The software's answer is always the shortest. If there's no answer for obtain the target, the software draw the result nearest possible to the target. The software can spend a few seconds before displaying the answer. 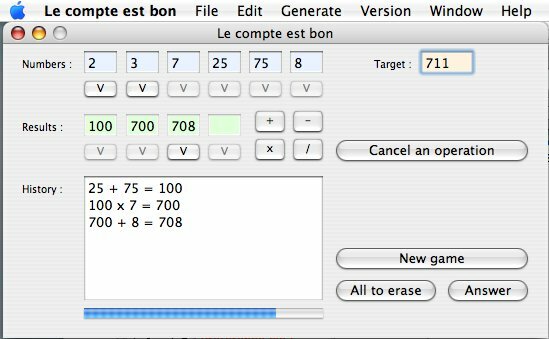 Le compte est bon is delivered in Freeware, that is to say it's free. But if my software pleases you, even so you can send me a little bit of money, a postcard, a PayPal donation (top on the right) or an E-mail in order to encourage me to create other softwares or improve this one. Distribution of this software Le compte est bon v2.4 and documentation are unrestricted, so long as the documentation and software are maintained together, unmodified , in the distribution. You can deliver my software on CD-Rom in condition that it is delivered freely (I wish to be kept informed). Haut de la page - Page précédente - Page générée en 0.00092 sec.